I've prolonged writing this email not because I have nothing to say, but because I find it difficult to package all I have encountered into words that will accurately and effectively deliver my experiences to you. The people here are friendly, the food spicy, and the culture fascinating. 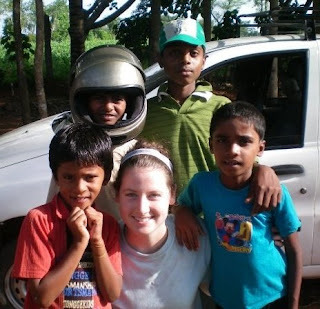 My initial exposure to India was Indian traffic. Traffic in India makes L.A. automobilists look shy and tame. Traffic lanes are mere suggestions and drivers use horns as an indicator of presence, rather than a sound of anger - despite the disorderly traffic patterns. Weaving in and out of traffic, passing cars on the wrong side of the road, and whole families riding on a single motorcycle is completely normal. The traffic of India is composed mostly of motorcycles and vespas as well as autorickshaws (motorized rickshaws that are the equivalent of taxis here), stray cows, cars (which are very tiny), bicycles, pedestrians, roaming dogs, and large beasts hauling carts. All these modes of transportations somehow blend harmoniously. I have yet to see a driver here become angry or frustrated despite the surrounding chaos, and I've have witnessed a grand total of one accident. Women are well protected here. Once, one of my program director's female friends was walking down the street and someone touched her from behind. She cried out and immediately 30 men swarmed the scene and beat up the perpetrator. He was left with a broken hand among other injuries. Men hold each other accountable here. One of the more comical happenings here was on our (the other interns and I) tour of the Brindavan Garden in Mysore. This beautiful garden with vast grounds and calming fountains is a magnet for tourists - mostly from other parts of India. One Indian family must of found the color of our skin something worthy of photographing because they insisted that we pose for a picture with them. No longer than a 30 seconds after we had all smiled for the camera, I noticed the mom standing next to me, holding her child. Apparently, she wanted a candid photo, with me as the backdrop - haha. The local language in Mysore is Kannada - a language that requires careful attention to the which syllable you apply the emphasis to. In Kannada, there is no equivalent for "thank you," "please," or "excuse me." Words we consider imperative to our everyday etiquette are considered a waste of time here. No one expects you to vocalize such feelings because no one expects you not to be thankful and if you accidently bump into someone, its never assumed to malicious in nature, as it frequently is in the United States. My internship project here is to help construct a school building at an existing school, as well as interact with the children who attend that school. If there's one thing that transcends cultural differences, it is the nature of children, they are same in India as they are in the US - loving, simple, and easily pleased. The school that I am working for is called "The Home for Learning." Some of the children live there and others return to their families at the end of the day. Despite having very little, these kids do not feel sorry themselves in the least bit. They are well mannered, self-disciplined, and fun loving. By the second day I was there, they were all calling me akká (spelling questionable), which means elder sister. One little boy, named Promode (again, spelling doubtful), taught me an Indian dance and insisted on helping me load bricks needed to construct the new building. Though all the children are very thin, they eat about two or three times what I do (and those of you who know me, know that I am not a light eater). I wasn't aware it was physically possible for someone who barely comes up to waist to consume such large quantities of food. Before they eat, all the children dutifully press their hands together and chant a prayer. Many people at the school, and other people I have interacted with in restaurants, etc have asked me earnestly whether I like India. They are eager to see if I am impressed with my country and how it compares to the US. When I reply that I am enjoying my time here, they seem relieved and satisfied. While constructing the school, I struck up a conversation with one the workers - a seventeen year old boy named Rajj. He asked me many question, including whether I liked India, and then inquired what the difference was between India and the US. After giving it some thought, I replied, "everything." Though it wasn't a very helpful answer, it was the truth. The similarities between the two countries are few and far between. Every day we go through a process, one that becomes so habitual to us, one that becomes so mechanical, that we stop thinking about it. The processes we committ everyday in the US - driving, eating, crossing the street, speaking, relieving ourselves, cooking, showering, dressing, praying, doing business, and way of thinking are completely different in India. If any other comrades are taking part in any interesting experiences this summer, feel free to let us know and we can share your experiences with the Lefty's community as well! I don't pretend to be an expert on the governmental systems of foreign nations, but there is something happening in Iran that will define both the nation and the region for years and possibly decades to comes. All phone lines out of the nation's capital city, Tehran, have been severed. Internet use is being heavily monitored and followers of the reformist candidates are no longer sure what is real and what is a set-up by state officials. I'm sitting in a library in Muncie, Indiana, so I'm not exactly a credible source on what's happening on the streets of Tehran, but I'll conclude with a few links that have information about the events occurring in Tehran. Feel free to add anything else in the comments section.